On a superhydrophobic surface, condensate droplets can spontaneously jump off the surface upon coalescence. The self-propelled motion results from the surface energy released upon drop coalescence, while the out-of-plane jumping results from the superhydrophobic substrate breaking the symmetry of energy release. In this talk, we will first illustrate the physical mechanisms of the self-propelled jumping by comparing experimental results with a 3D phase-field simulation. We will discuss the capillary-inertial scaling of the jumping velocity and the conditions conducive to the spontaneous motion. We will then discuss two applications of jumping drops: a new self-cleaning mechanism for water-repellent surfaces that works in the absence of external forces, and a planar phase-change thermal diode that is inherently scalable to large areas. 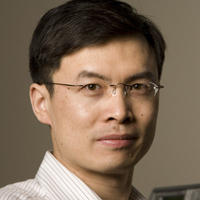 Chuan-Hua Chen is the Hunt Faculty Scholar and Assistant Professor of Mechanical Engineering and Materials Science at Duke University since 2007. Dr. Chen received his B.S. degree in Applied Mechanics from Peking University (1998) and Ph.D. degree in Mechanical Engineering from Stanford University (2004). Dr. Chen is a recipient of the NSF CAREER Award and the DARPA Young Faculty Award.